Copper pipes: approximately fifty years. Galvanized steel pipes: approximately seventy five years. Brass pipes: up to one hundred years. Cast iron pipes: approximately one hundred years. PVC pipes: over one hundred years! Polybutylene pipes were used in some homes approximately twenty to forty years ago. These pipes very unreliable and susceptible to failure. The failure is a result of piping materials and fittings breaking down, but is mistakenly attributed to poor workmanship in many cases. Some homeowners assume that because their piping has lasted some years without failure that it is not defective. Actually, most polybutylene pipes last for up to twenty years before failing. Different factors can affect the lifespan of piping, and in the right conditions, each type of piping can certainly exceed their lifespan. The type of ground in which the piping is seated can have an impact on piping life span. Whether pipe surrounded by sand, rubble, or tree roots can affect the lifespan of pipes. Piping in old homes may certainly be near the end of its life cycle, and if you’re not sure about piping age or materials a plumbing inspection may reveal more information. Can a slab leak damage my home or property if not detected quickly? Very seldom does any structural damage occur as the result of slab leak. A slab leak is usually detected before it causes any significant damage. The water leak is usually the size of a pinhole. This small hole allows water to continually leak out very slowly. Over time it can result in a significant build of water. Leaked water usually stays under the house and saturates into the ground soil. This can potentially cause a cavity if the house’s foundation was not properly compacted. This is a rare event and in general, there is little concern over structural damage as the result of a slab leak. To fix water leaks underneath concrete slabs plumbers must repipe the leak. A concern with repipe repairs is new leaks occurring in the repaired area. For this reason we may suggest an alternative plumbing solution which is generally less invasive and provides a permanent solution to the water leaks. With three options for dealing with a fresh water leak under the slab, a full repipe is often the best choice. Over the many years that Kenz Plumbing has been in business, fresh water repiping of your home has become a specialty task for the experienced crew. 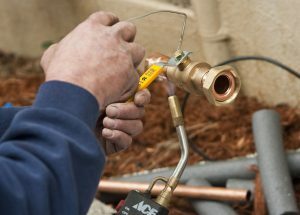 Based in Port Hueneme, with a strong local customer base, has given us a unique area to perfect our repiping process. In Port Hueneme, there are a few local developments with an unusually high rate of leaks in the copper plumbing located beneath the homes’ concrete slabs, commonly referred to as a ‘Slab Leak’. The best course of action with a slab leak in these problem neighborhoods is to abandon the copper pipes beneath the slab, and install a new fresh water system in the walls, ceilings, and attics. While repiping the home is the preferred choice of action with a slab leak, it is not the only option. When Kenz plumbing initially diagnoses a leak as being under the slab, three choices are given to the homeowner. In some cases it is best and most economical to jack-hammer and repair the section of pipe in question. The first option is to locate the leak under the slab, and then access the affected pipe and make a spot repair. This process involves removing any flooring over the leak, then using a jackhammer to expose the pipe to make the repair. While it sounds like a major task, it can actually be the least expensive choice. We will locate the leak, create access and repair the leak, then patch the concrete usually within a few hours. There are some situations that cause a spot repair to be either not possible, or not cost effective. for example, if the leak is located underneath a cabinet, shower or bathtub, then the cost of making access can be almost as much as a full repipe. In other cases there may be what is called a ‘Post-Tension Slab’, in which high tension cables are installed in the slab during construction, that make it unsafe to use a jackhammer, as a broken cable can cause bad and very costly damage to the foundation. In the case of a ‘Post-Tension Slab’, we will recommend either a full repipe, or a partial reroute. Partially rerouting an affected area of pipe can be done when it’s not possible to jack-hammer and repair. A partial reroute is basically a small scale repiping of one or more affected areas of the plumbing underneath the slab. In cases where jackhammering and repairing the pipe are not cost effective, it is possible to only abandon the affected section of pipe and reroute the line through the walls, ceilings and attics. Costing less than a full repipe, the end result is that there will still be old copper plumbing under the slab that may leak again in the future. We have experienced homes having 2 or more slab leaks within a 1-2 year period, and these repairs can add up in cost very quickly. This is the main reason why we will recommend a full repipe in certain neighborhoods, based on our experience. In the case of a full repipe you will be left without any of your freshwater pipes below the slab. With three options for dealing with a fresh water leak under the slab, a full repipe is often the best choice. Considering the location of the leak, the condition of the slab, and the development the home is located in are all important factors when making the decision to repipe, versus repairing or rerouting. Kenz plumbing has the experience to guide you in the right direction when your home is affected by a slab leak. Most full home repipes can be completed within 1-3 days. On the first day, the water is usually back on, so that the homeowners are not displaced for any amount of time. The patching of drywall and stucco is done immediately afterward, and can take 1-2 days. The process of repiping is invasive and stirs up a lot of dust, but we take great care in protecting your home and furnishings. The first step when we arrive in the morning to start your repipe is to cover exposed floors with dropcloths and to separate the areas where drywall cutting will occur with plastic sheeting. We will also cover furnishings and belongings when needed. At the end of the day, after the plumbing inspector has approved of the job, we will clean up our mess thoroughly.